Personal failure is the most underrated motivator in our society. The rite of passage to greatness is not only achieved by figuring out what it takes to win, but also figuring out what it doesn’t take. There are many powers, graces and misfortunes in our world that can be harnessed to improve one’s self, but none are as indiscriminate and direct as failure. 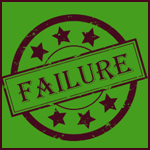 Failure is in some sense truth – a truth that measures who we are compared to our past selves and others around us. In order to find said truth, one has to fail. If you take away failure you take away truth. There is a moment when defeat sets in, a void consuming victory that once was thought obtainable, that a choice has to be made. The debate roars, floods of emotions surge against confliction, pushing aside hope and triumph. What could have been done differently? Is there anything left that could have been given? Admiration is given to the victor. Finally, a realization: There was still more to give; there is always more to give. The moment produces a personal vow. It’s time to seize the glory of triumph. Reborn again, an attitude bred for success, win or fail. This is the sacrifice to continue the journey for greatness. A journey that forges inner strength, a strength that is earned, never given. So the question is, why is society so eager to eliminate failure? Generations of people have gained a false sense of accomplishment, distorting their expectations of success and the work needed to obtain that success. Doing something without measure or with a false measure is denying and manipulating truth, which destroys the desire to compete. Without a ‘true’ measure, a person is never aware of their potential or lack of potential. Competition is the only way to create failures and winners, but also create failures who have a desire to win. You can’t produce inner strength or virtues by participating, there has to be something (or someone) to chase. It is in that chase where we find greatness, or the ability to be great. Greatness is earned. And remember, if everyone is a winner, then no one is a winner. Beat you to the top!